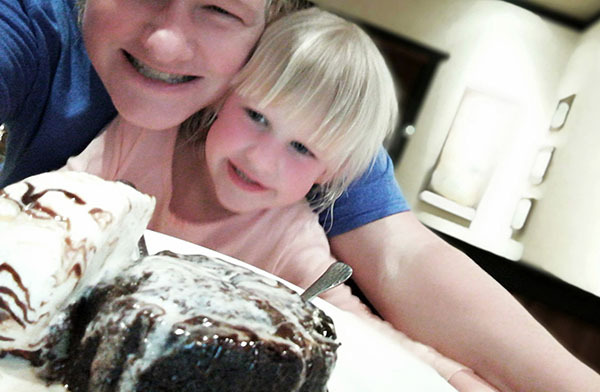 One of the things our family loves about having a branded credit card that rewards you with points to a specific hotel chain is that you always know what to expect. Our family stays at Hyatt Place hotels never disappoint. 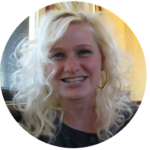 True, the suspense and adventure of traveling to foreign destination and deciding on an airbnb simply by the inflated and superfluous descriptions of the owners carries with it a sense of mystery, both have their rewards. 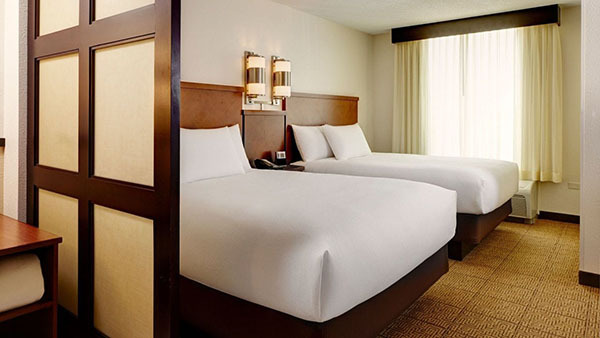 We’ve written about what to expect at Hyatt Place Hotels. Big rooms, sleeper sofa plus two queens or one king, breakfast included, pools, fitness center and really comfortable digs. 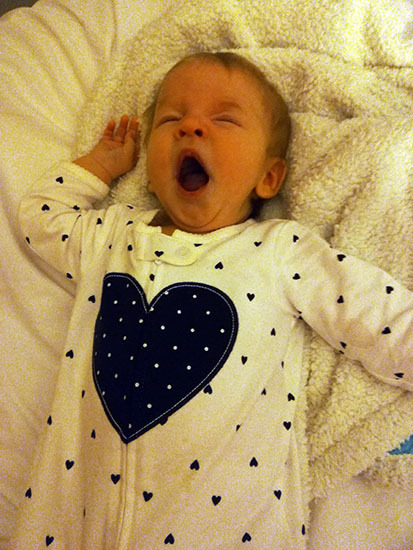 That never changes, and that’s the best part for our family! 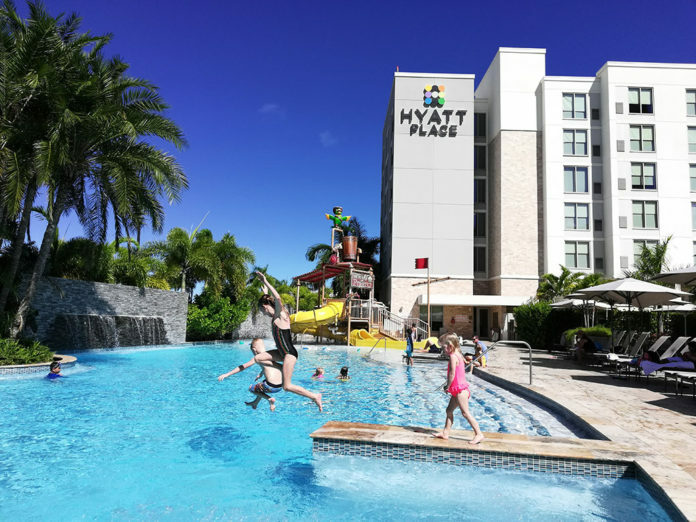 At the same time each hotel offers something a little different; the Hyatt Place City Center San Juan is downtown, close to the beach and has a really fun pirate themed water play place in addition to a huge pool! The location at the Hyatt Place City Center San Juan is central to downtown, however, downtown San Juan is not like downtown of most big cities. Things are still pretty sprawled out and you shouldn’t expect a big epicenter of activity when staying here. While I wouldn’t say it is located in the most convenient area, it is within walking distance to a lot of activities, and is only about a 15 minute drive from the airport. Most of the restaurants you can find nearby will be chains: Texas de Brazil, Longhorn Steakhouse, and Sizzler. It was harder to find food than we anticipated being that we were in a central downtown location. Typically we try and eat food we can’t get at home, but one of our nights in San Juan we picked up take out ribs from Longhorn Steakhouse. They were exceptional! Eclair and I even shared a special dessert at the restaurant while we waited which we both thought was pretty special. Based off google maps, we had hoped it would be closer to the water. However the inlet that you can see and access from the hotel isn’t exactly a swimming beach. It is more industrial and you have to venture over to the other side of the peninsula to access a leisurely beach. 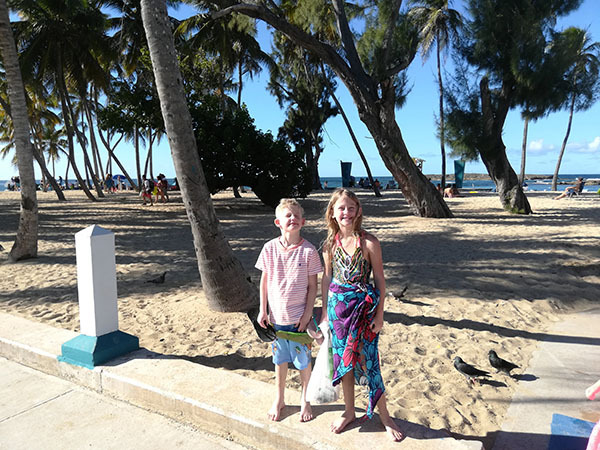 We took a family taxi and ventured out to Balneario El Escambron with a protected coral reef enclosure, bathrooms and showers and more, plus dined at El Hamburger which tastes a lot better than it looks! Within a 10-15 minute walk from this location you can reach a Walmart, Walgreens, a local grocery, and Los Pinos Café which is a local favorite. The churrasco here was one of the best we’ve ever had! Also within walking distance is Condado Lagoon National Park, a Music Conservatory, an Art Museum, a movie theater and a Dollar Car Rental. What we loved most about this Hyatt Place was the pool. Admittedly though, we hardly got to enjoy it as it was freezing! I’m sure that it makes little sense to heat an outdoor pool in Puerto Rico, and unfortunately we just happened to travel after an abnormal cold spell. The water was freezing, but the kids managed to enjoy themselves for several hours each day nonetheless. On the far end of the pool is a pirate themed water structure with slides, water guns, and a huge bucket that fills with water that empties every 10 minutes or so. This leads into the main pool with a zero entry level gradual incline. There is also access by way of stairs adjacent to the swimming area. There are deceptively alluring sauna jets located at the opposite end of the pool with beckoning glowing lights, although it is not sauna and neither is it warm. There are plenty of places to lounge by the pool or the outdoor bar, either in the sun or the shade. Towels are provided. A waterfall in the pool blocks out the city sounds and the pool area is enclosed with high shrubbery. 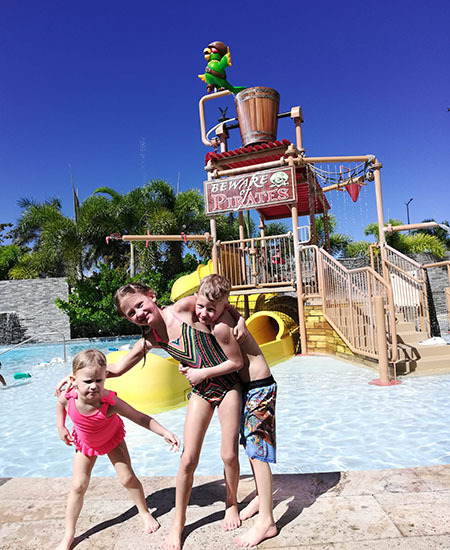 ► For Kids: The pool is what makes this location such a treat for families. Whatever the Hyatt Place City Center San Juan lacks, it makes up for at the pool. Sure, beach is fun, but this pool may be even more so! Where is your favorite place to stay in San Juan? For our next trip we are thinking our family would love to head down to Luquillo and spend our time near El Yunque and the pristine beaches there. 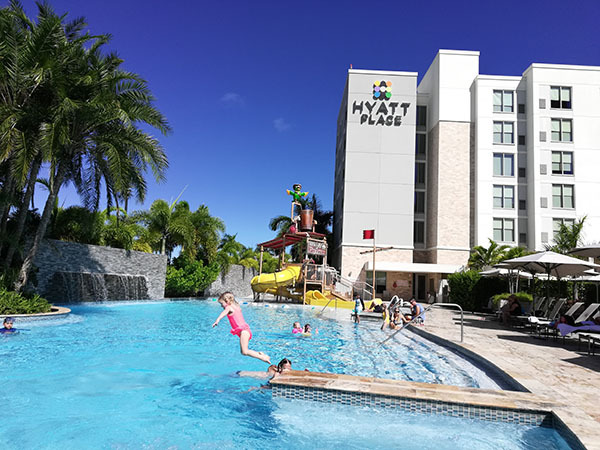 ► Nap-Time Version: Our family stay at the Hyatt Place City Center in San Juan, Puerto Rico for Miss Molasses first family adventure! Check out our other fun activities in Puerto Rico including making our way out to the island of Vieques and Black Sand Beach (coming soon)!